For other people with the same name, see Mike Williams. Michael Troy Williams (born January 4, 1984) is a former American football wide receiver who played in the National Football League (NFL). Williams played college football at USC, and received consensus All-American recognition. The Detroit Lions selected him in first round of the 2005 NFL Draft, and he also played for the Oakland Raiders, Tennessee Titans, and Seattle Seahawks of the NFL. Williams was born in Tampa, Florida. He attended Henry B. Plant High School in Tampa, and played both high school football and basketball for the Plant Panthers. As a senior, Williams had 38 receptions for 789 yards (20.8 average reception) with twelve touchdowns. Williams' honors included Tom Lemming All-American, Super Prep All-Dixie, PrepStar All-Southeast Region, St. Petersburg Times All-Suncoast second team, and Tampa Tribune All-Hillsborough County. During his junior year, Williams made the all-state Class 4A second team while making 35 receptions for 803 yards (22.9 avg.) and 12 touchdowns. As a sophomore, Williams made 28 receptions for 631 yards (22.5 avg.). In basketball, he averaged 16.9 points, 8.3 rebounds and 4.6 assists as a senior in 2002. As a junior in 2001, Williams earned Tampa Tribune All-Hillsborough County first team honors, averaging 14.7 points, 10.7 rebounds and 5.3 assists while helping his team to the state semifinals. Williams attended the University of Southern California, where he played for coach Pete Carroll's USC Trojans football team from 2003 to 2004. Before attending USC, Williams was offered scholarships to Florida State University and the University of Florida, but neither school saw him as a wide receiver. Williams played split end wide receiver during most of his games for USC. Williams played in all 26 games during his freshman and sophomore years at USC, and started 15 of those games. He wore jersey No. 1 while on the football team. His freshman season, he had 81 receptions for 1,265 yards and 14 touchdowns. These statistics are all USC and Pacific-10 Conference freshman records. Williams was named First-Team Freshman All-American choice by The Sporting News, Scripps/Football Writers, and Rivals.com. Selected as the Pac-10 Freshman of the Year, named to the All-Pac-10 second team, All-American honorable mention, The Sporting News Freshman All-Pac-10 first team, and The Sporting News All-Pac-10 Freshman Offensive Player of the Year. In his final season, as a sophomore, Williams started all 13 games at wide receiver, and led the Trojans in receiving yards and touchdowns which resulted in 95 catches leading to 1,314 yards and 16 touchdowns. Williams was a finalist for the 2003 Biletnikoff Award (nation’s top receiver) while finishing eighth in Heisman Trophy voting. He also earned first team All-American (AP, ESPN.com, Football Writers, and SI.com among others) honors. Williams also was a 2003 All-Pac-10 First Team selection and CBS.Sportsline.com National Player of the Year. That year he also completed two pass attempts for 38 yards and one touchdown against Michigan in the Rose Bowl, and blocked a field goal. Ohio State running back Maurice Clarett was suspended by his school following his 2002 freshman year. After being unable to gain reinstatement with Ohio State, Clarett made the decision to declare for the NFL Draft. However, since Clarett was only of true sophomore eligibility, he had to legally challenge the NFL rule that a player must be three years removed from high school to be eligible for the NFL Draft. After a court proceeding, a federal judge ruled that the NFL could not legally bar Clarett from entering the 2004 NFL Draft. Williams, having completed his sophomore year and only two years removed from high school, made the decision to declare for the 2004 NFL Draft as well after hearing the federal judge's ruling. Williams hired an agent and moved forward presenting himself as a legitimate first round pick (and most, if not all, NFL pundits and NFL personnel agreed that Williams was a first round choice). By declaring his intent to enter the draft, hiring an agent to represent his interests, and filing the NFL paperwork necessary to enter the draft, he made himself ineligible for NCAA reinstatement. Still, prior to the 2004 NFL Draft the United States Court of Appeals for the Second Circuit overturned the Federal Judge's decision allowing Clarett to enter the Draft. Additionally, the United States Supreme Court refused to hear a final appeal. Clarett and Williams were ineligible for the 2004 NFL Draft. As Williams was ineligible for NCAA reinstatement, he was required to sit the entire 2004 football season and was not allowed to practice with USC as well. All values from USC Pro Day, except Ht, Wt, 40-yd dash (and splits), and Wonderlic, which are from NFL Combine. Despite sitting out an entire season, Williams was selected 10th overall in the 2005 NFL Draft by the Detroit Lions, the third WR drafted in the first round in as many years by the Lions. Williams selected jersey #88, which had been retired in honor of Hall of Fame tight end Charlie Sanders. As a rookie in 2005, Williams, appeared in 14 games with four starts. Williams recorded his first touchdown catch in his NFL debut, a 3-yard pass from quarterback Joey Harrington, in the season opener against Green Bay. Williams made his first career start against the Ravens and had 1 reception for 7 yards. Williams had a career-long, 49-yard reception in Cleveland. He finished that game with 5 receptions for 95 yards. Williams then again started in Minnesota and had 4 receptions for 43 yards. Three-of-four receptions were for first downs. Williams was then inactive for the Lions game in Dallas due to an injured ankle. Williams had a season-high 6 receptions for 84 yards against Atlanta and had a 21-yard reception for a first down in New Orleans on the Lions opening drive. He finished his rookie season with 29 receptions for 350 yards and 1 touchdown. In 2006, Williams was on the inactive list for both of the Lions' first two games. He played in just eight games in the 2006 season, and made eight catches for 99 yards and one touchdown. During the Lions' Week 15 loss at Green Bay, Williams led the Lions in receiving yards after catching three passes for 42 yards. Williams caught two more passes in a Week 16 loss to Chicago, but posted several drops as well, and was unable to secure a potential game-winning touchdown pass thrown by Jon Kitna as time expired. During the Lions' Week 17 win on the road in Dallas, Williams caught two passes for 28 yards, including a fourth quarter 50-yard pass. Williams was traded along with Josh McCown to the Oakland Raiders during the first day of the 2007 NFL Draft in exchange for a 2007 fourth-round pick which the Lions used to select A.J. Davis. In Oakland, Williams reunited with his former college positions coach Lane Kiffin. On October 28, 2007, in a road game against the Tennessee Titans, Raiders quarterback Daunte Culpepper threw a pass to Williams which, if caught, would have given the Raiders the first down and brought them into the red zone. Instead, Williams dropped the football and the Raiders lost possession, on a turnover on downs, and lost the game because the Titans maintained possession for the remaining time on the clock. Williams' error turned out to be his last play with Oakland as the Raiders released him a few days later. Williams signed with the Tennessee Titans on November 22, 2007, reuniting him with former USC running back LenDale White and his former offensive coordinator from USC, Norm Chow. ESPN's Chris Mortensen reported that Williams weighed 250 pounds at the time of the signing, unusually high for a wide receiver, where most position players are less than 230 pounds. He was inactive for his first game with the team. He saw action in the next two games but made no receptions. Williams lost 30 pounds in the off-season by boxing, playing basketball, and doing pilates. He reported to organized team activities in May 2008 at 240 pounds. On July 31, the Titans released Williams. Williams (17) and Marshawn Lynch during the Saints January, 2011 Wild Card win over the New Orleans Saints. After spending two years out of football, Williams signed with the Seattle Seahawks on April 15, 2010, reuniting Williams with former USC head coach Pete Carroll. 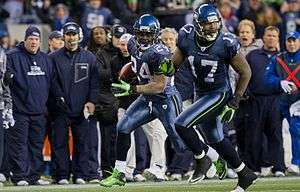 After the Seahawks released T.J. Houshmandzadeh, Williams joined the starting unit, and during his debut for Seattle, Williams recorded four catches for 64 yards. In Week 6, he had career highs in both catches and yards going 10 catches for 123 yards in a 23-20 win against Chicago. He topped this performance four weeks later against the Cardinals, catching 11 passes for 145 yards. On Monday, January 3, the Seahawks rewarded Williams for his comeback season with a three-year contract extension. Williams followed this up with a disappointing 2011 season in which he had only 18 catches. After reporting to mini camp in 2012, he was released by the Seattle Seahawks on July 13. In July 2012 the Kansas City Chiefs, Miami Dolphins, and San Diego Chargers expressed interest, but he was not signed to a contract. On May 23, 2013, Williams signed with the Toronto Argonauts of the Canadian Football League and was released on May 31. In 2015, Williams accepted a position as head coach at Locke High School in Los Angeles. ↑ "Tennessee Titans 2007 Transactions". ESPN.com. Retrieved 2007-11-23. ↑ "Titans release former 10th overall pick Williams, sign ex-Jet Davis". ESPN. 2008-07-31. Retrieved 2010-12-29. ↑ Mike Willams signs with the Argonauts. ↑ Smith, Cam (March 24, 2015) Former USC, NFL receiver Mike Williams named new coach at L.A. school USA Today High School Sports. Retrieved January 27, 2016.